ook, it's us! The dot in the rings. 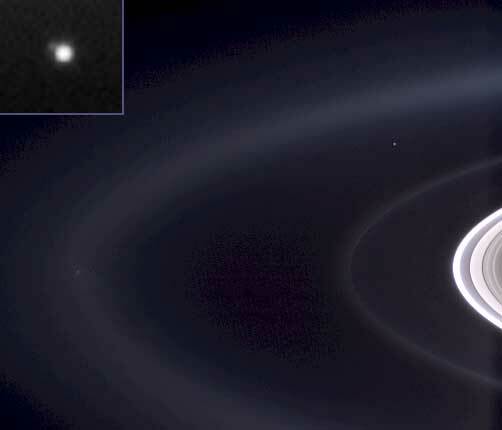 From about 1.5 billion kilometers*, Cassini spots our bad selves between some rings around Saturn. As big as it seems sometimes, it can't be over-stressed what a tiny speck we are in the greater insanity that is the universe. Meditating on this a few times a week can really put things into perspective. It can also drive you to extremes of anxiety. Either way, time well spent. How insanely cool is it, though, that we have actual pictures from cameras that we've parked around other planets? Props to NASA. Despite the insane bureaucracy and the politics, they have great researchers doing fine work there. * — It's really past due to move to SI units. I could mention to our US readers that it's 930 million miles, but I'll refrain. Not that either gives anyone but those used to astronomical units a good intuitive feel for the distance. I guess AU is the best distance unit here (distance of Earth to Sun). It (and Saturn) is about 10AU away from us. Very nice indeed. Thanks, nik.